Some journeys are made in miles and some in memory. And sometime, both miles and memories make the journey together. This week, during our run-away to the farm days, we made a cemetery journey in miles and memories. Our family in cemetery life is as scattered as they were in living life. Most, however, are in or near Marshall County so that makes it at least a doable afternoon journey. One set of grandparents lie outside Vermillion, Kansas where as youngsters they grew up and where their parents lie, one set in Frankfort, Kansas, again, where the parents, my great-grandparents, lie. My mother and dad are in Barneston, Nebraska, just over the State Line from Kansas, and my father, John, and his firstborn son, Walter Joe, are buried in Barnes, Kansas which is where we lived as children when our father died. Yes, the lineage is complicated and even more complicated in the reading since it seems I have two fathers in different cemeteries. And I do. So anyway, as you can imagine, the circuit around all of those takes the better part of a day. We didn’t do all the grandparents this time, only my double set of parents. Cliff and I drove to Barneston, Nebraska first, as Nebraska is only three-quarters of a mile north of the farm and Barneston just a few miles north of that. When you’re a farmer, or a farmer’s daughter, you learn to make a clean circuit rather than backtrack across the countryside. Barneston has a small town cemetery, as all the family plots are in for that matter. The gravestones are a little haphazard, some date back to the mid 1800s and in one corner, bounded by a fence with bluebird houses on each fencepost, a headstone rock for the Otoe Indians who were native to the area and with whom Grandpa Albert, dad’s dad, traded when he first moved onto the farm. Grandpa liked to tell us kids “Indian Stories” as he called them. I also noticed that all the decorations (in the country, by people of a certain age, it’s still called Decoration Day), were plastic. No iris yet bloomed, no peonies, both traditional plants in rural cemeteries. I heard my mother’s old lament from past years in my head, “The peonies won’t be ready for Memorial Day this year.” It’s been a cold spring. When young, we had no plastic flowers, only live, cut flowers from the yard, sometimes stuck into quart jars with water. Hence, not having the iris and peonies bloom was a problem. My mother always wrapped her bouquets in aluminum foil to keep them fresh until at least the end of the day. I put plastic flowers on Mom and Dad’s graves and on Grandpa Albert’s and his wife Susan’s although she died the year before Mom and Dad married and we moved to the farm. I didn’t know her. But I knew Dad’s stories of her. And then we drove down to Barnes, Kansas. This is a bigger, neater cemetery. There’s a covered graveyard registry with all the names, and corresponding plots, in alphabetical order. Stones lined in rows, all, for the most part standing straight. Some date back to pre-Civil War days. Those are mostly young children. The cemetery in Barnes puts flags by veteran’s graves in little holders branded by the war of the time. Some held the insignia for a Civil War soldier, some for World War I, some for WWII. I didn’t see any for later wars. My father’s flag holder is marked WWII. I’m glad he has a flag. I guess that if Little Joe had lived, he might have been in the Vietnam War. For whatever reason, a sunnier hill, or less wind, or a bit further south, or fewer cold storms, the peonies and lilacs were in riotous bloom. I planted peony bulbs by my father’s grave once, but you just about have to live in an area to tend graves and make sure the mowers don’t flatten new and tender shoots. We put plastic flowers on John Sunderland and Walter Joe’s graves. And then we came home. Our backyard was riotous in color in just the few days we’d been gone. Peonies and iris and roses in full bloom. This morning, I cut fresh flowers and took them to church. The photo above is from that cutting. 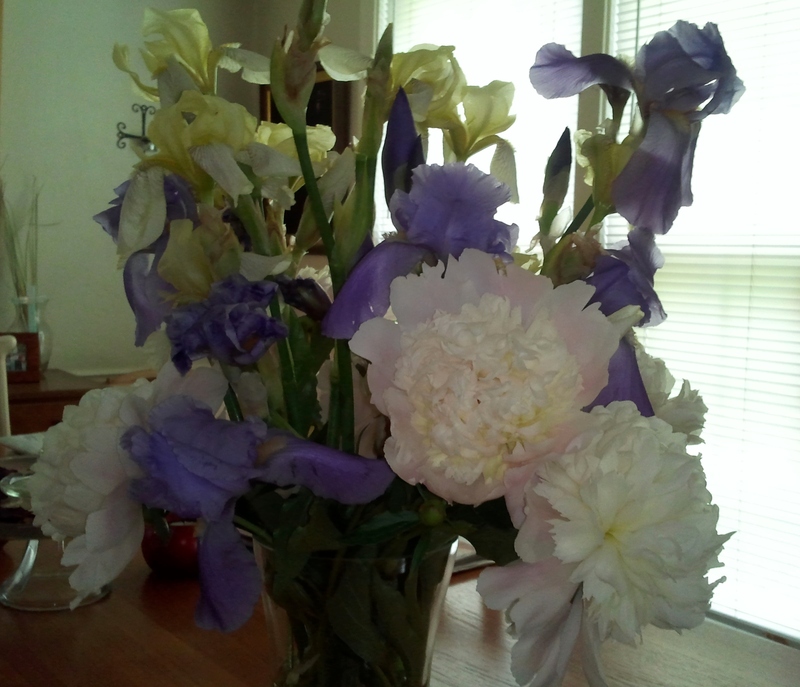 But these aren’t just any peony/iris/flowers. These have a history of journeys too. The purple iris are Grandpa Joe iris, the grandfather buried in Frankfort whom we didn’t visit this time. Not that I got them from him, rather, Zita, who was a friend of my mother’s up by the farm, dug up rhizomes and gave me several sacks a couple of years ago. But they aren’t just any old iris. These smell like grape pop. I’d searched forever for iris that smelled like grape pop. Impossible to find in a greenhouse; only possible from a farm friend’s old iris bed. The yellow iris are my Grandmother Sunderland’s iris, the grandmother who is buried in Vermillion. We didn’t visit her either. But my cousin, who had dug up Grandma’s iris back when, dug up these and I planted them. The peonies are also Kansas peonies, dug up by my oldest cousin, Howard, and passed on to me several years back. Just as my journey back to Kansas was a twisting turning road, the journey these flowers took has a lot of curves even if not as many miles as I traveled. And they are still in pretty good shape. No doubt they will likely outlast my own journey, when you get right down to it. And travel into another Memorial Day; another journey into stories. Next Weekly Photo Challenge: The sign says….